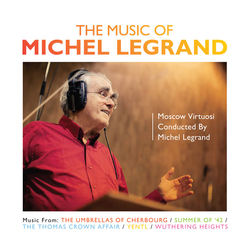 Michel Legrand revisits some of his greatest work on this release including The Umbrellas Of Cherbourg, Summer Of ‘42, Wuthering Heights, The Thomas Crown Affair and Yentl. Recorded in October 2010 in Moscow, Legrand arranged, conducted and produced this 2CD set which underlines fully the timelessness of his music alongside the highest standards of musicianship. The Moscow Virtuosi were formed in 1979, bringing together the cream of musicians from Moscow’s symphony and chamber orchestras. Legrand ranks amongst the greats of film composing through a distinguished career that spans half-a-century and over 200 films. His attributes range from singer, pianist, songwriter to conductor, actor, screenwriter and film director. He has worked with many of the greatest artists of the 20th century including Frank Sinatra, Miles Davis, Orson Welles, Barbra Streisand, Edith Piaf, Aretha Franklin, Ray Charles and Maurice Chevalier. He has been the winner of three Academy Awards for music, all of which feature on this release. The Windmills Of Your Mind won Best Song in 1969, Summer Of 42 Best Score in 1971 and Yentl in 1983 for Best Original Song Score.